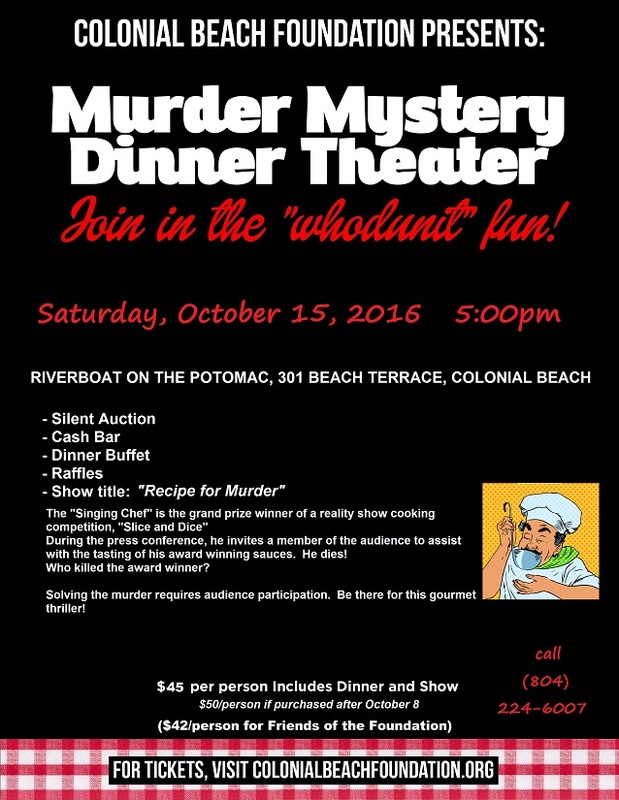 There's a Murder Mystery Dinner Theater event that takes place annually in October and it is a popular fundraiser for the Colonial Beach Foundation. It was held for the first time on October 25, 2014 at the beautiful waterfront Wilkerson's Seafood Restaurant and every year since then it has been held at the Riverboat due to space requirements. The event just keeps growing every year and is a favorite activity for many. The theater troupe that puts on the show is Sherwood Road Productions and they do a fantastic job of acting the parts of the various characters while getting the audience involved in the fun - and the mystery! The event kicks off with a cocktail hour beginning at 5:00pm and then the show begins while dinner is served simultaneously. In 2015, the dinner buffet consisted of Italian food offerings to fit the theme of the show that was being performed. During intermission there are 50/50 raffle ticket sales. Those with long arms should take advantage of the "wingspan" option where you buy a strip of raffle tickets which measure the length of your arms. Your chances of winning are greatly improved! There are also numerous silent auction items on display for bidding on. All proceeds help to fund philanthropic and beautification projects for the town. The CBF also maintains the town's Community Center which is located at the corner of Marshall and Nelson. Tickets for dinner and the show are $45 each at the regular price or $42 per person for the Friends of the Foundation. Ticket prices go up to $50 a week or so before the event. They can be purchased online at the Foundation's website or by phone at the number indicated on the flyer. 2015 - "Murder on the Set" The Let's Make Movies movie studio is filming "Amour: A Reason for Crime" and it is discovered that something bad has happened to the head of the studio. Who is responsible? Was it the director who had been told recently that this would be the last film the studio would allow him to direct? Was it the Producer who hadn't had a blockbuster film in 10 years? Was it the lead actress who was attempting to make a comeback? 2016 - "The Singing Chef"